Today we got our first real, accumulating snow of the season. It looks like the total will be around 1.5 inches. Since it has been cold the past few days the snow started sticking immediately. Roads around Bethesda are generally good. Primary and secondary roads are wet and neighborhood streets have been treated with a sand/salt mix. Montgomery County public schools stayed open all day but canceled evening activities. This year Bethesda will again have it's Winter Wonderland weekend. It starts on Friday December 3rd at 8pm at Imagination stage (4908 Auburn Avenue) with a free Choral Concert featuring American University Gospel Choir, BlueLine, Euphonism, and Georgetown University Phantoms. 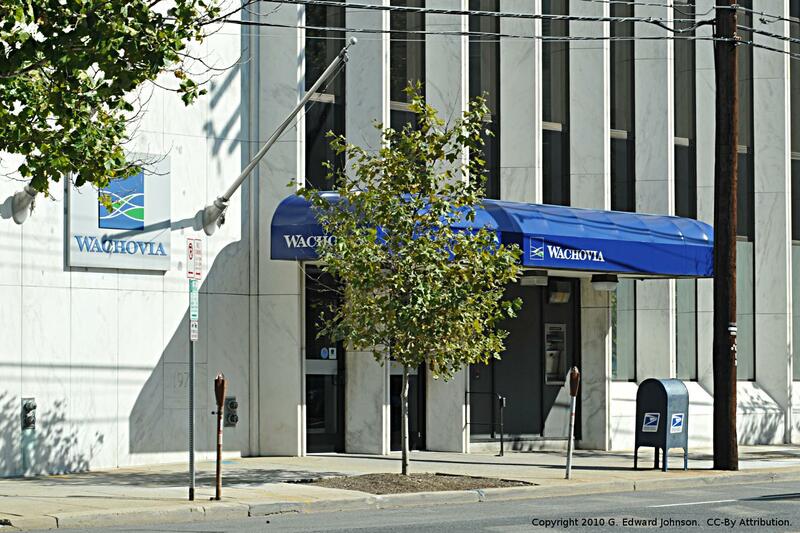 On Saturday from 1-4pm it continues in Veteran's Park on the corner of Norfolk Avenue and Woodmont Avenue. 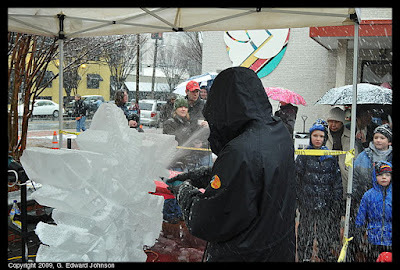 There will be live Ice Sculpting from 1-2pm (see the picture below from last year's Wonderland). From 2-4pm there will be Santa Claus and singing by some local schools (Garrett Park Elementary School, Our Lady of Lourdes, Seneca Valley High School, St. Jane de Chantal, Watkins Mill High School, Winston Churchill High School). The past few rainstorms have resulted in a huge puddle in the middle of the road on the corner of Wisconsin Avenue and Montgomery Avenue in Bethesda, MD. I wrote about it (and took pictures) back in September. The cause of the problem was a clogged storm drain right at the corner. The good news is they have started replacing that drain. 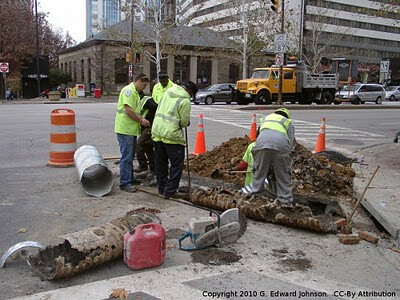 Yesterday they were pulling out the old pipe and putting in a shiny new pipe. 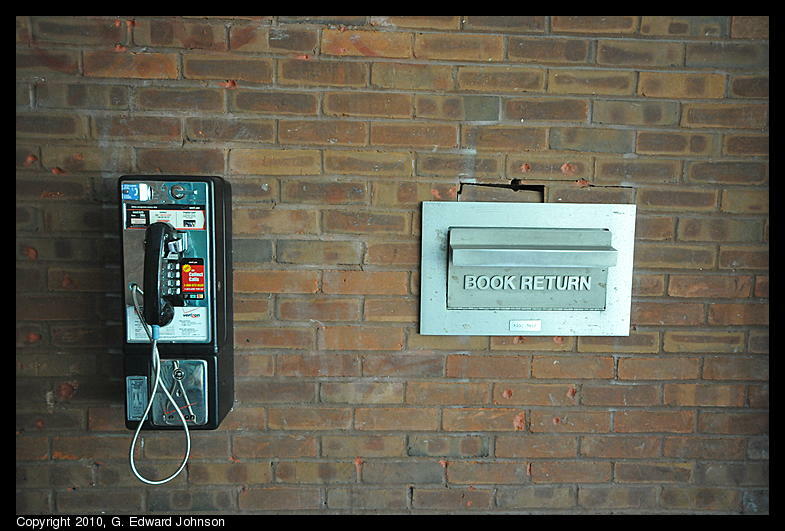 You can see from the picture below that the old one was in really bad shape. 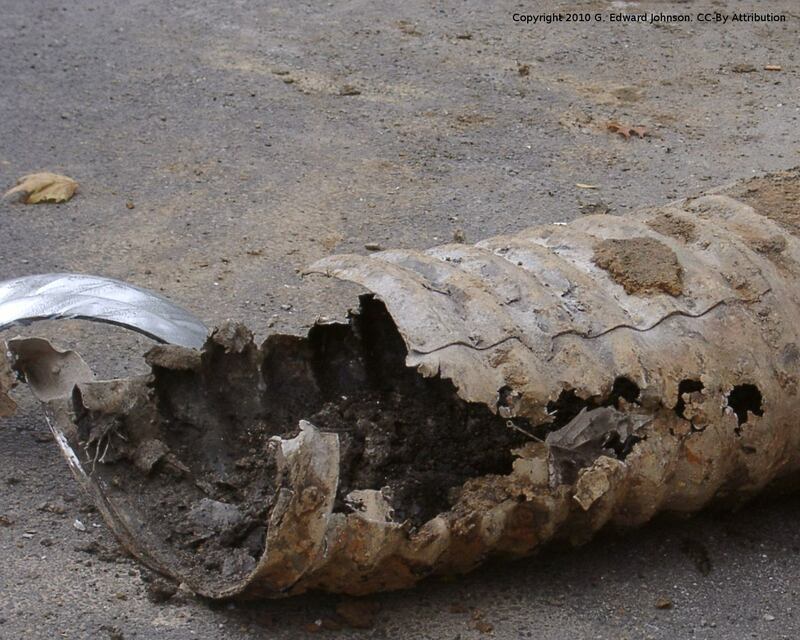 It had corroded through in many places and had lots of dirt built up in the bottom. They only replaced the dozen or so feet closest to the drain, I don't know if they will be back after the holidays to do some more or if they are done. As I was out and about today I noticed that Kabob Bazaar is now opened. I spoke with one of the people who works there and it turns out that they just opened today. 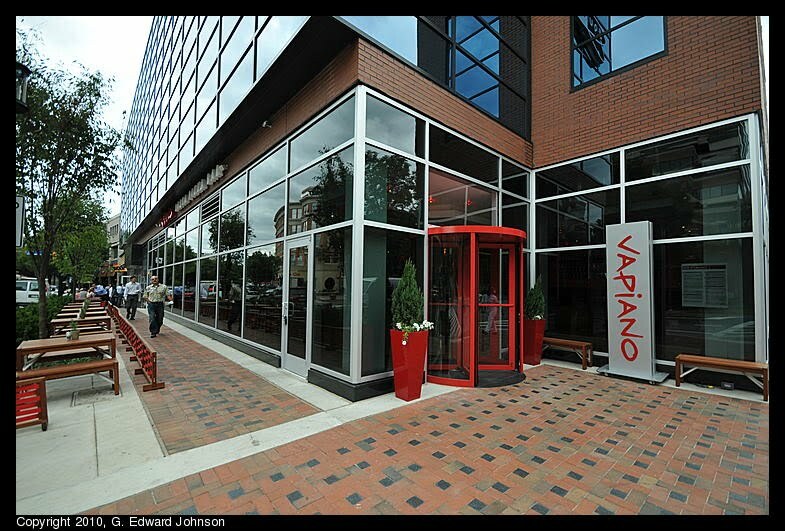 It is where Javian used to be and before that was Mongolian Grill. 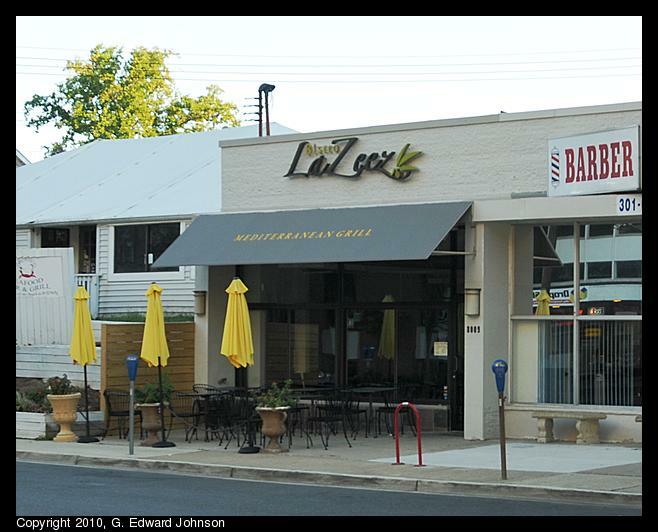 There is also a Kabob Bazaar on Wilson Blvd in Arlington. 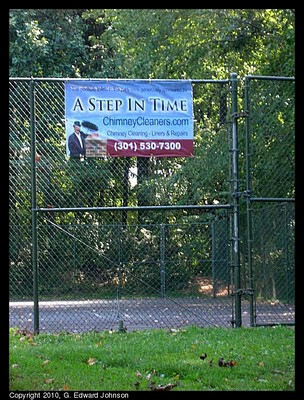 I noticed these cute little fences around the trees on Old Georgetown Rd near Wisconsin Avenue. 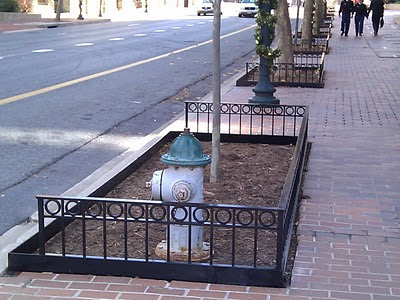 Hopefully this is just the start of things and they will put some plants around the base of the trees too. I'm not sure if this is a Bethesda wide thing or not, but it looks like it is at least around the Clark Building. I saw these at Hinata Sushi Carryout and Grocery on St Elmo Ave in Bethesda, MD and, given the proximity to Halloween, couldn't resist getting some. 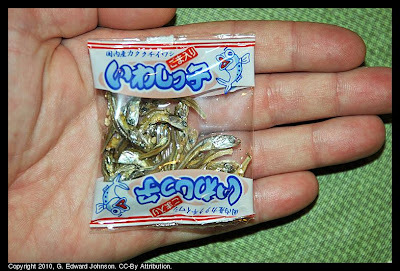 They are single serving, snack size dried sardines. 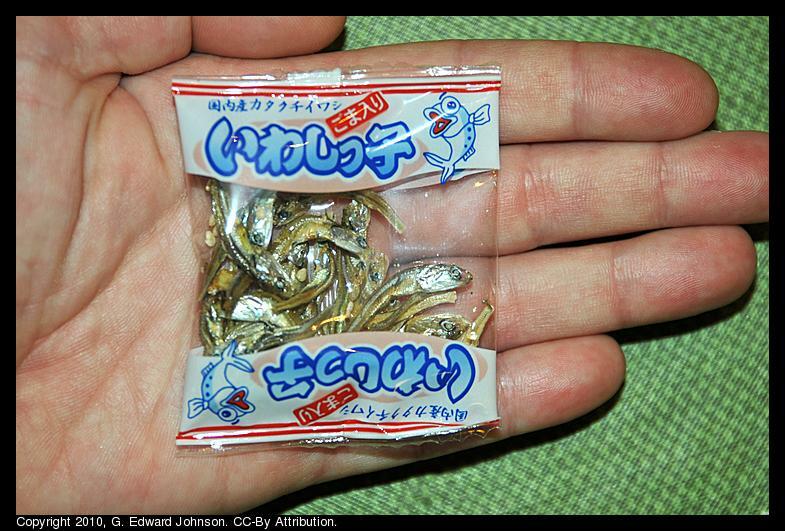 Each sardine is about 1.5 to 2 inches long. In addition to the fish, there is a bit of corn syrup and sesame seeds. Since I got them, I felt obligated to try some. 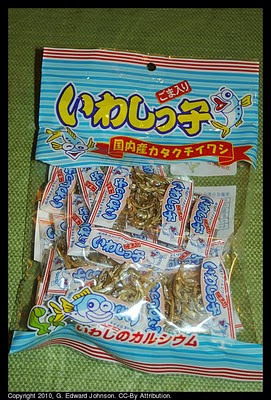 They are crunchy and taste a little bit fishy. If you can get over the fact that you are eating whole fish whose dried out eyes look like they are pleading with you to spare them, they are perfectly edible. I ate about half a package before deciding I had enough. My cat quite enjoyed them and has been asking for more. According to the nutrition label (The only part of the package that is in english) they have no fat, 3g of sugar, 3g of protein, and 24 calories per serving. A serving is three packages. 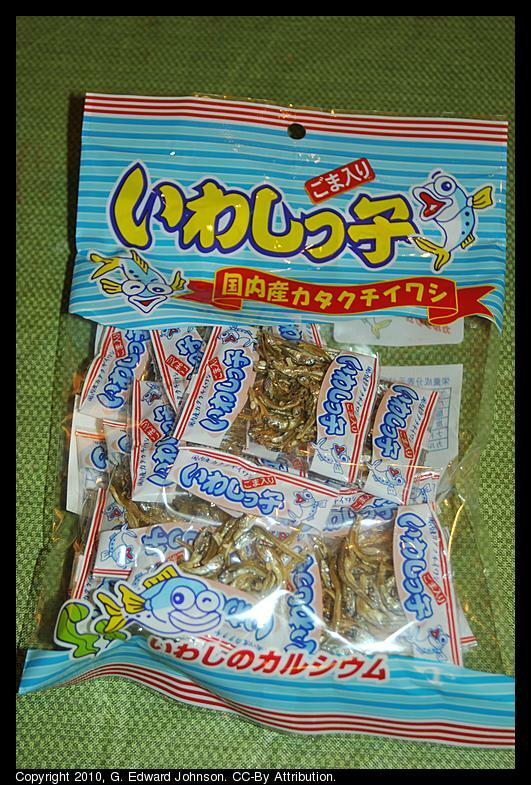 Hinata has more than dried fish snacks, they also have fresh sushi and a plethora of other Japanese snacks. 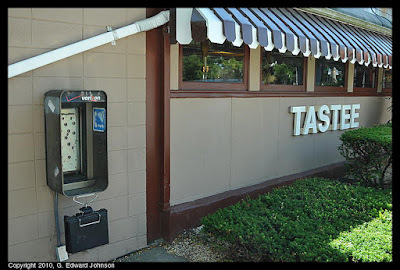 If you want something a little out of the ordinary, this is a good place to go. 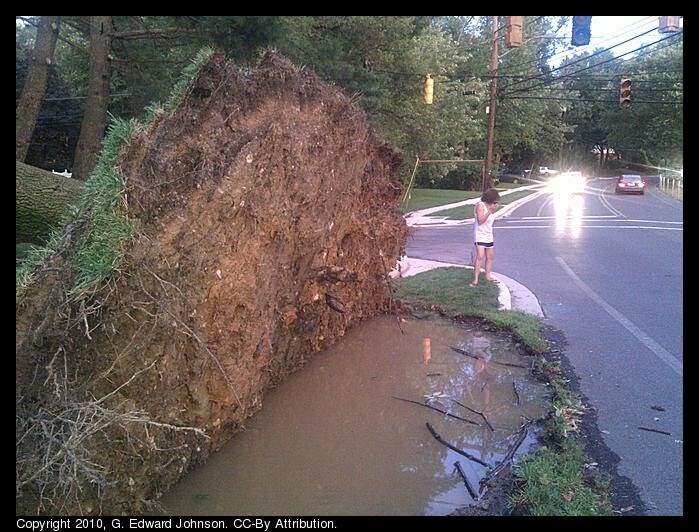 Yesterday I got a Montgomery County severe weather alert and expected a pretty bad storm overnight. when you read "WIND FIELDS WILL SUPPORT ORGANIZED LINEAR STORMS CAPABLE OF DAMAGING WIND GUSTS AND NOCTURNAL TORNADOES." that is serious. So this morning I was glad that the wind hadn't woken me up and we still had power. 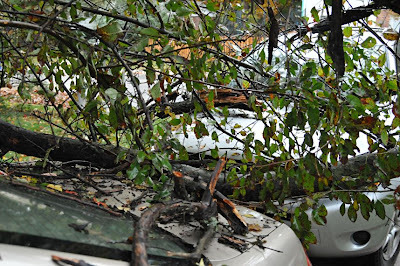 It doesn't look like there was much damage here in Bethesda, though I did find a tree on these two cars. There are lots of things you tend not to think of until something happens and you need to. Finding a body shop is one of those things. Can anyone recomend a good auto-body shop in Montgomery County, MD? 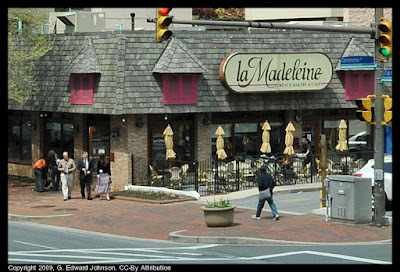 Normally I wouldn't post an entry just for a new sign on a restaurant, but today I was walking down Old Georgetown Rd here in Bethesda, MD and I'm like, whoa, what happened. Gone was La Madeleine's calm, beige and brown sign and in its place is a bright yellow and maroon one that really, really stands out. For comparison, here is the old sign. 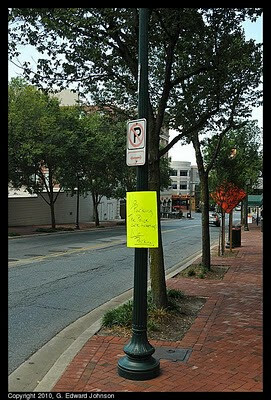 Kolmen 3-day makes its way through Bethesda. The Susan G. Komen 3-day walk for the cure came through Bethesda, MD this afternoon. 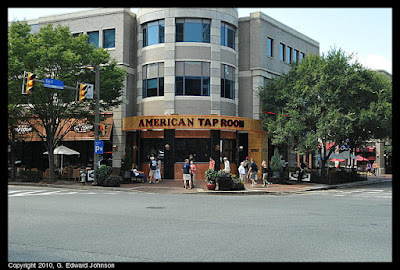 It started as a trickle, a few people set up by the Bethesda Metro station, an occasional person or two wearing a pink shirt mixed in with the normal lunch time crowd, making their way up the sidewalk towards Gaithersburg (their stop for the night). Later, it turned into a frequent, larger groups walking along the sidewalk and bunching up as they waited for traffic lights. There was a good sized cheering section by the Metro who cheered and shouted encouragement to walkers as they went by. How does Susan G. Komen for the Cure utilize the contributions? Net proceeds from the Susan G. Komen 3-Day for the Cure fund innovative global breast cancer research and local community programs supporting education, screening and treatment. Every major advance in the fight against breast cancer in the last 28 years has been impacted by a Susan G. Komen for the Cure grant. According to Charity Navigator, for fiscal year 2009,the Susan G. Komen for the Cure organization spends 84.4% of its budget on program expenses, 10.5% on administrative expenses, and 6% on fundraising expenses. The president of the charity, Hala G. Moddelmog made $531,924. As the afternoon has progressed, the flow of people has really increased. Earlier in the day you'd see groups of 5-10 people waiting to cross streets, now it is more like 15-20. Here are a couple pictures from around 4:30. 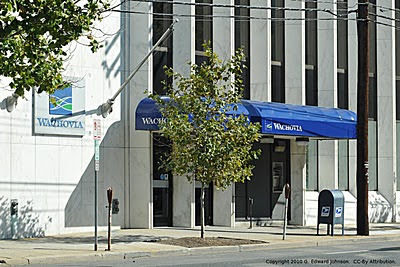 Shortly after noon, two people held up an armored car outside this Wachovia bank on the 7900 block of Wisconsin Ave (MD-355) in Bethesda, MD. The suspects reportedly fled in a black jeep, going northbound on MD-355. There have been other armored car robberies in the DC area in the past week that are possibly related. 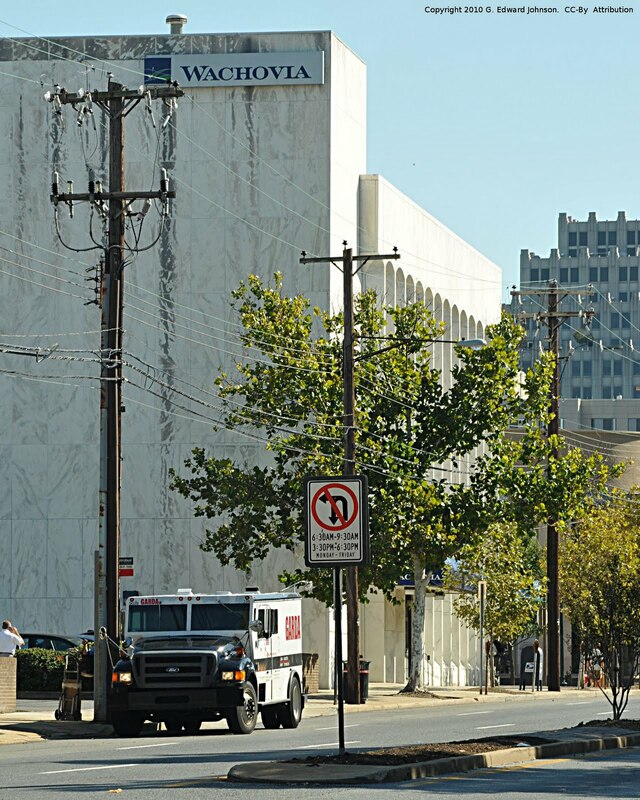 The top photo was taken this afternoon and shows the armored car involved in the incident. Police tape had surrounded this vehicle but it was removed prior to the picture. More information at Patch and TBD. 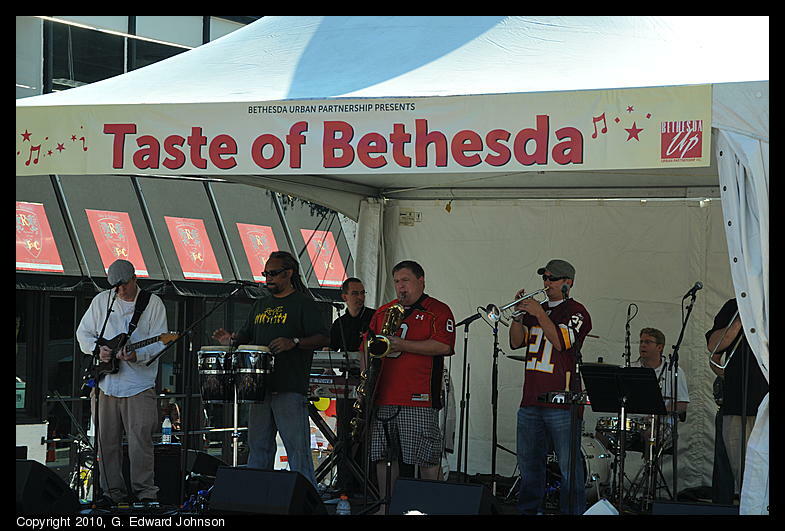 Taste of Bethesda couldn't have happened on a better day. The sun was shining and it wasn't too hot. The streets were packed, lots of people came out to try the food. I tried a bunch of it myself, the Pad Thai from Bangkok Garden was great, I also tried Lamb Stew from Ri-Ra, some crispy pork dumplings from Hanaro, and Gazpacho from Daily Grill. It wasn't just food either, I watched The Players Band on the Fairmont Avenue stage for about 20 minutes. 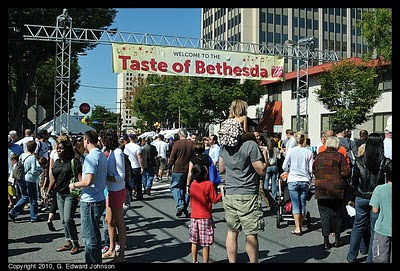 Today from 11am to 4pm is the 21st annual Taste of Bethesda. This is one of the biggest events in Bethesda, MD each year. 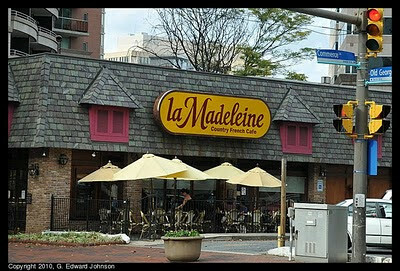 There are going to be more than 50 different restaurants participating this year as well as entertainment on 4 stages. 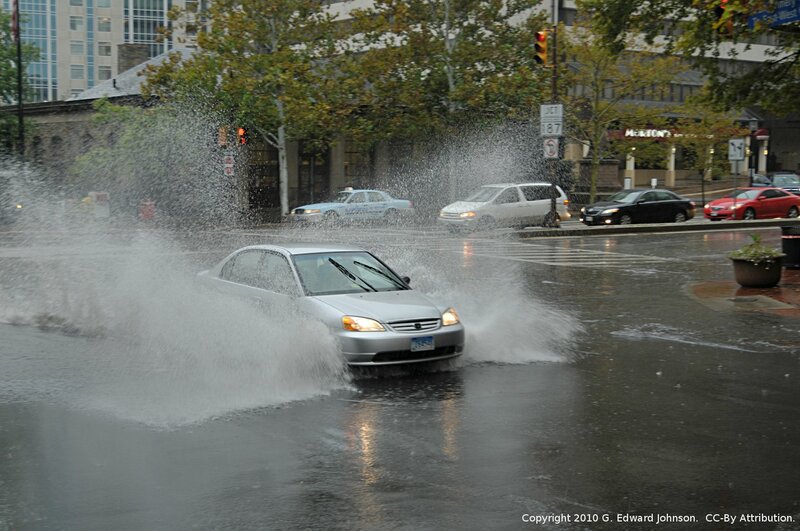 The corner of Wisconsin Avenue (MD-355) and Montgomery Ave has been taking a beating the past few rainstorms. Water really pools up in the rightmost northbound lane of MD-355 and you have to drive through it if you are in that lane or if you are crossing on Montgomery Avenue. This is not the first storm that this has happened, there is a storm drain right on the corner that is clearly clogged. They have put up a "High Water" sign but haven't yet cleared the drain. I saw someone with a large video camera taking video of this corner so it will probably show up on the news at some point. So far, I've been a bit disappointed in this storm. They promised torrential rain and so far we have only seen heavy rain. 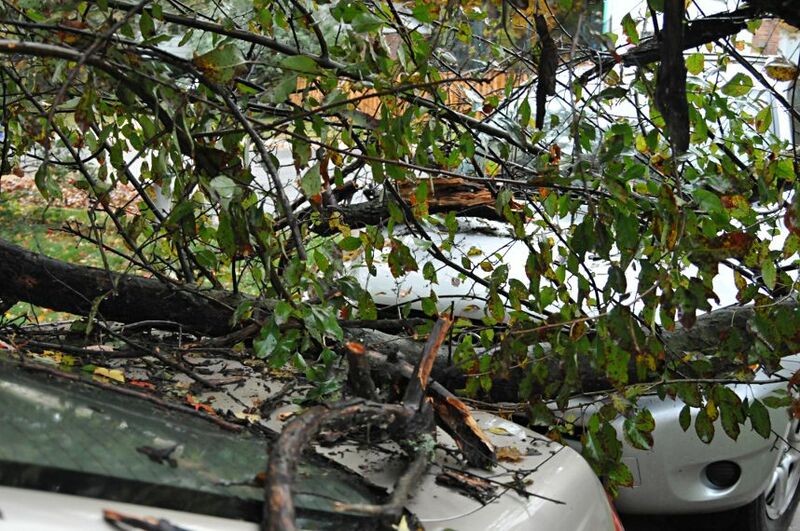 The good news is that Bethesda hasn't been hammered with falling trees and power outages. AOL recently started a network of local news sites called patch. At the beginning of the week there Bethesda news site BethesdaPatch started posting articles. It isn't a blog, the articles are longer, newspaper style articles (hopefully with newspaper style fact checking). This is a great addition to the area and I look forward to reading its articles. Welcome. You gotta love a sign which says "Don't Even Ask... Go Away". 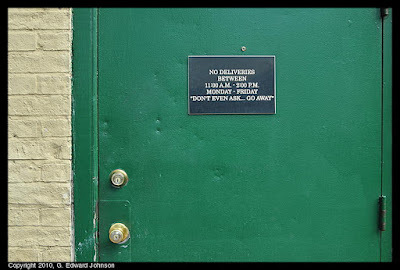 This one is on the Barking Dog's delivery entrance on Elm Street in Bethesda, MD. 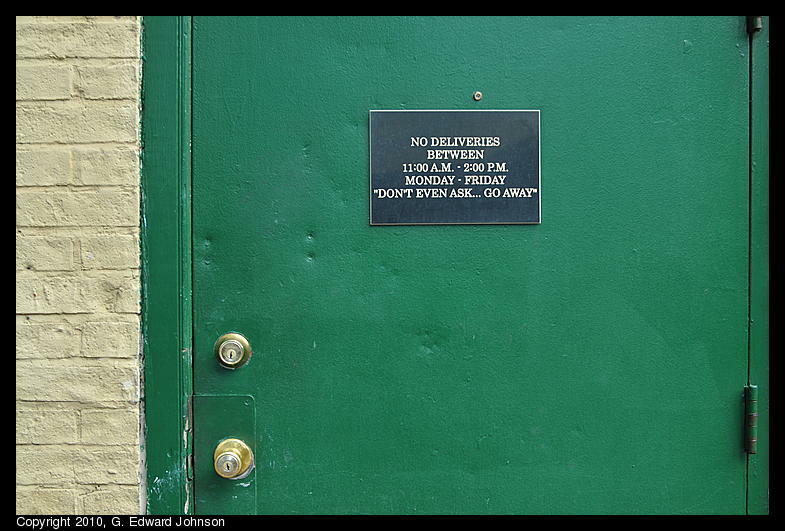 The full sign reads: No Deliveries between 11:AM - 2:00 PM Monday - Friday "Don't even ask... Go Away"
A number of new restaurants and stores have opened in Bethesda, MD in the past couple of months. Some I have written about but others I haven't. 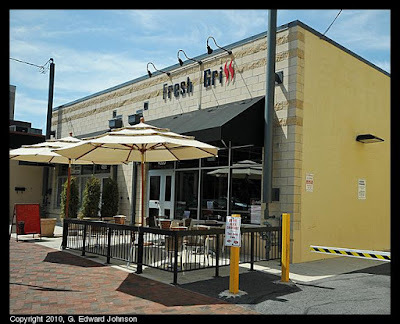 I was sorry to see Austin Grill, a long time resident of Bethesda Row leave us. I will also miss Organic To Go, it only lasted six months or so. 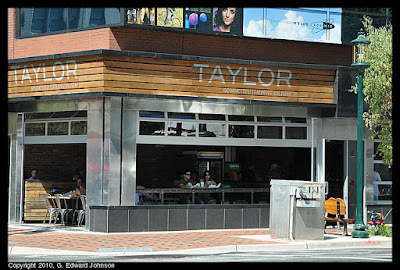 New to the area is Taylor Gourmet and Vapiano which I just wrote about and across the street from them, American Tap Room. 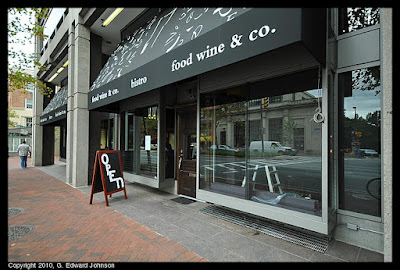 Food Wine & Co just opened last week on Wisconsin Avenue where there used to be a Pizzeria Uno. 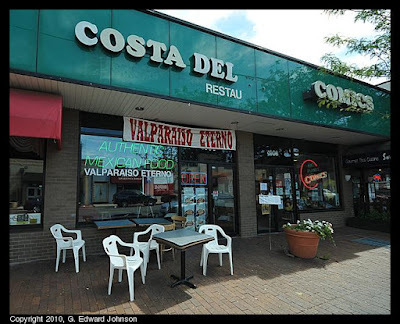 Fresh Grill I already wrote about, but across the street, the former Costa Del sol is now Valparaiso Eterno, both of these have free WiFi and are on Fairmont Avenue. La Zeez Mediterranean Grill snuck in while I wasn't looking, I'm not sure when it opened. 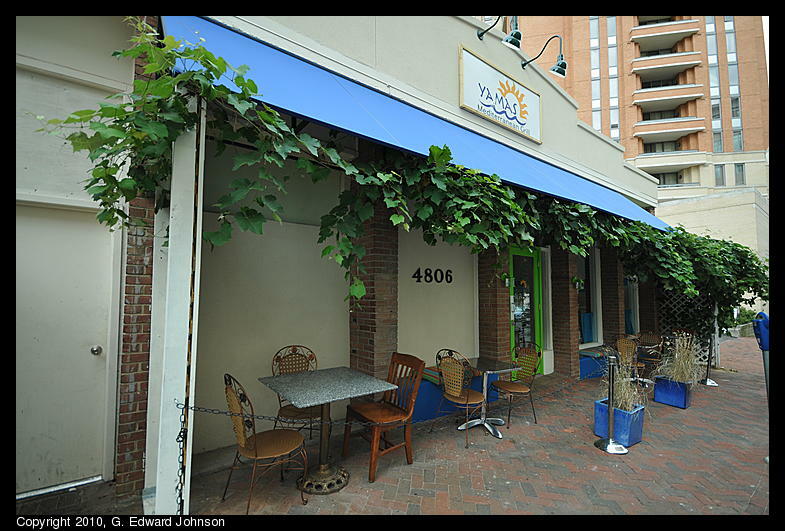 In the past few weeks Yamas Mediterranean Grill also opened near the corner of Woodmont Ave and Rugby Ave. I hear they make their own gyro meat so I have to try them out. 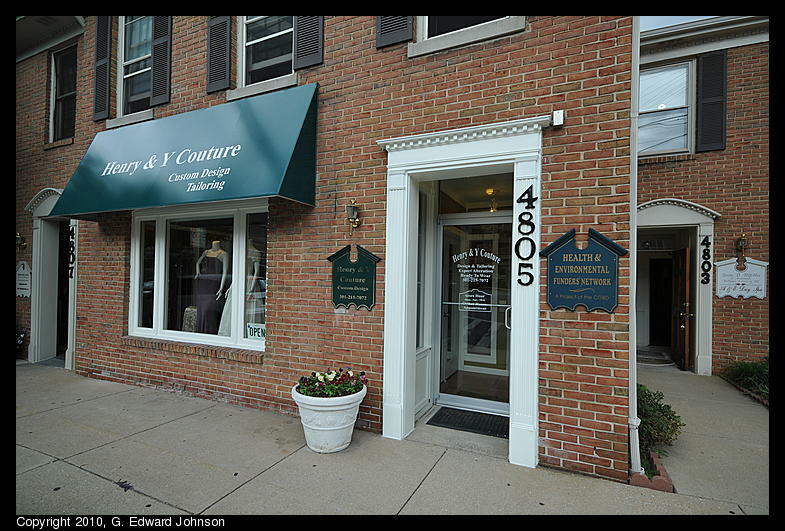 It isn't just restaurants, Henry & Y Couture just opened late last week at the former location of D. Gilpin Jewelers on St. Elmo Avenue. Not everything is open yet, Uptown Deli is still coming soon. Also coming soon is Cava, where Organic To Go was on Bethesda Ave and Annies Bistro Francais on St. Elmo where Cafe Gelato was. The Waygoose isn't leaving us, it is just moving from Bethesda Avenue to 4926 Hampden Lane. I have been following the progress of this building on Woodmont Avenue between Hampden Lane and Elm Street ever since they started tearing down the old one. Although Equinox Fitness hasn't opened yet, two of the tenants have. Taylor Gourmet serves really good, huge sandwiches on crusty, chewy bread. I had one last week and really liked it. I haven't been to Vapiano yet but it is a world-wide chain of Italian restaurants serving made-to-order hand tossed pizzas, fresh, house-made pasta and hand tossed gourmet salads. 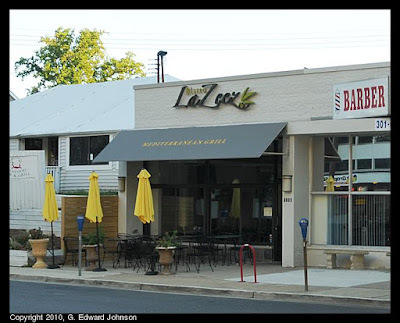 There has always been a bit of a dead zone on Woodmont Ave between Elm St and Old Georgetown Rd, in that multi-block stretch there was a single restaurant and no other retail. This new building shrinks that dead zone by a block. 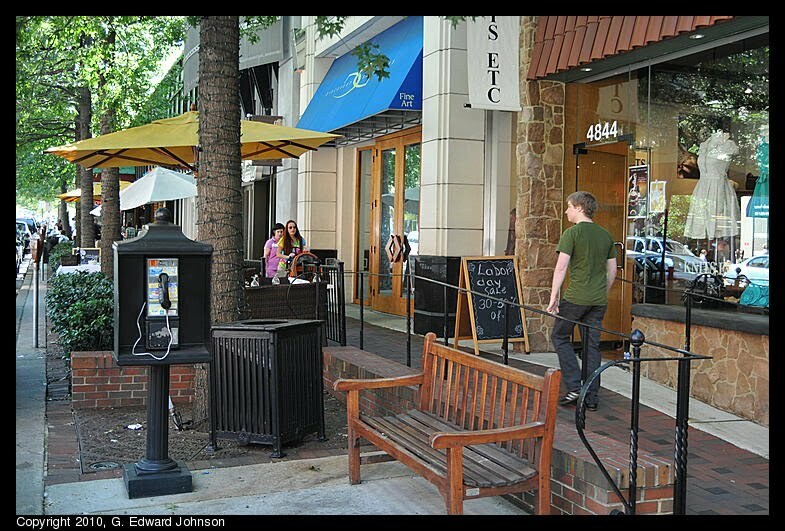 Two new restaurants and some great-looking landscaping along the street really make the area look nice. If you know of any others that still exist in Bethesda, let me know in the comments, I'll try and get pictures of them before they are gone. 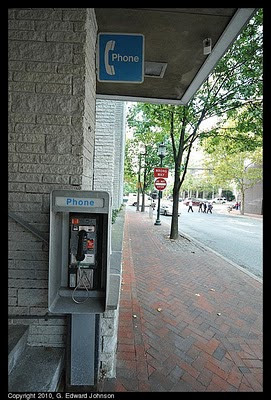 Feel free to share any Bethesda payphone related stories you have too. 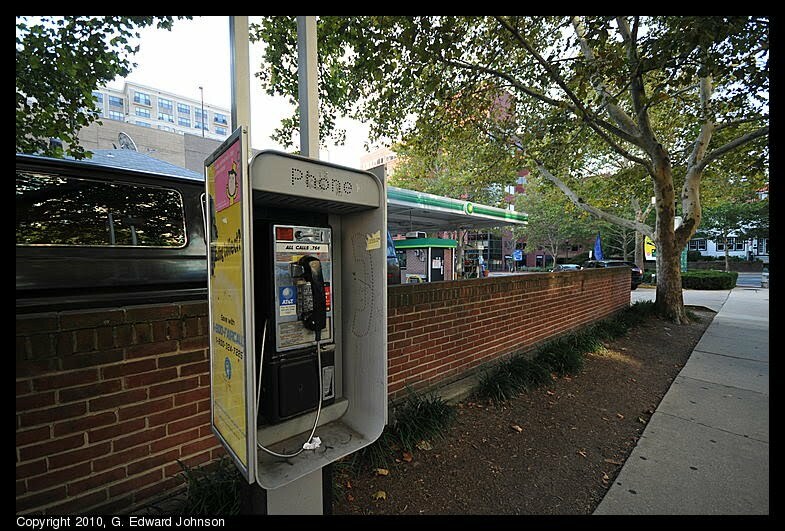 The payphone project has a sure to be outdated list of phones, I may try to track some of them down. Here are some ones that I have found so far. First, the one Ken pointed out on the 7900 block of Norfolk Avenue. 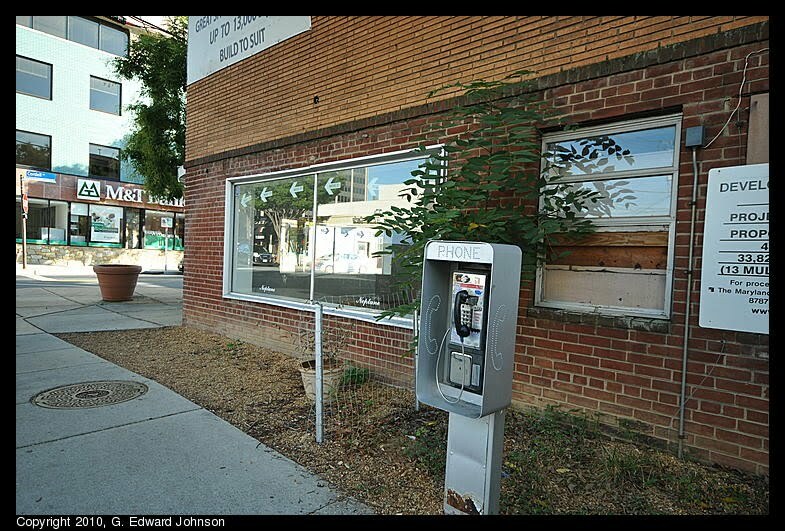 There is still one by the front door of the police station on Montgomery Avenue. 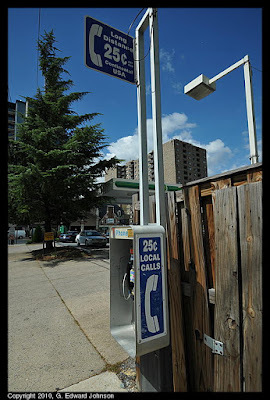 This one is at a gas station on Highland Avenue near Wisconsin Avenue. Here's three more I have found. On Fairmont Avenue near Old Georgetown Rd at the BP gas station. At Bethesda Library, right next to the book return. In the bus bays at Bethesda Metro Station. 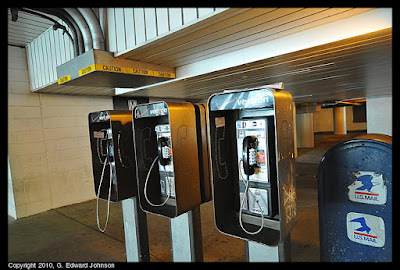 There are actually five phones in this bank, three on the front and two on the back. That's all I've been able to find, if you know of any more, let me know in the comments and I will try and get a picture. Fresh Grill has been open for a couple of months but I just noticed it this week. 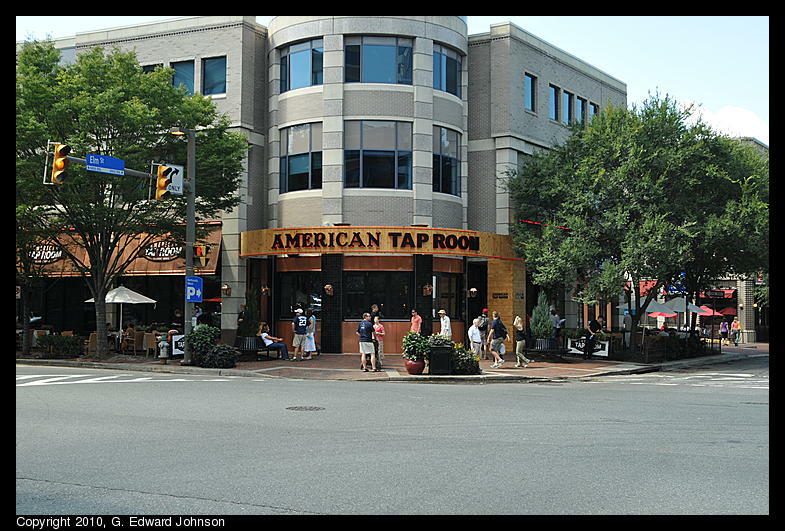 It's specialty is Angus burgers and it has gotten very good reviews on both yelp and chowhound so maybe their website's claim that they are "the most talked about burger bistro in Bethesda" has some truth to it. The interior is open, you walk up to the counter to order and you can watch them cook your meal while you wait. There are also a couple of TVs so you can watch while you wait or eat. Food is cooked to order so you will have a bit of a wait for your burgers. There is outdoor seating for when the weather is nice. The menu is burgers, burgers, more burgers, and a couple of other things. Three quarters of the first page of it is dedicated to "Build Your Own Angus Burger", then they have 10 additional signature angus burgers. Filling out the selection is the "Sandwich of the month" (pork loin right now), a chicken sandwich, a fish sandwich, two salads (grilled chicken and shrimp) and fish and chips. They also have beer, wine, and soda. All the sandwiches are served with seasoned, freshly made potato chips. 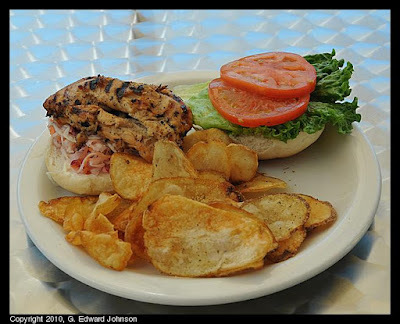 Just to be different, I got the WGC (World's greated chicken sandwich): grilled, marinated chicken over house slaw on a bistro bun with lettuce, tomatoes, and mayo. The house slaw is marinated and just a little tangy, it isn't a creamy, mayonnaise based coleslaw. It was delicious, the slaw really perked up the chicken. The chips were both a strength and a weakness, it is nice to see something besides fries, the seasoning was great, most of the chips were just the right crispness, but a few of them were a bit less than fully crisp. 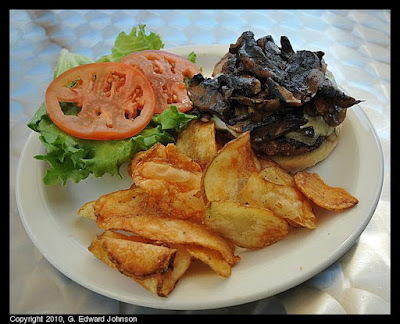 Other reviews I have read drool over their burgers so I went back a second time to try the Mushroom Madness burger. Swiss cheese, portabella mushrooms and saute button mushrooms. As promised, it was tasty, juicy, and tender. The mushrooms had a flavor of their own and whatever sauce they were cooked in didn't overwhelm the burger at all. It is a very good burger indeed. For a burger place, it isn't cheap, running around $10 each. These aren't your regular burgers though, they are half pound angus beef burgers cooked to perfection and very tasty. However they are prepared, they are still hamburgers, don't expect a life changing experience from them. You may have heard that Montgomery County, MD has fiscal problems this year. To cut costs, they decided to remove the portable toilets from the parks. This wasn't a popular decision so they came up with the idea of letting people or companies sponsor a park potty. I was at one of the local parks over the weekend and I saw the result of this. 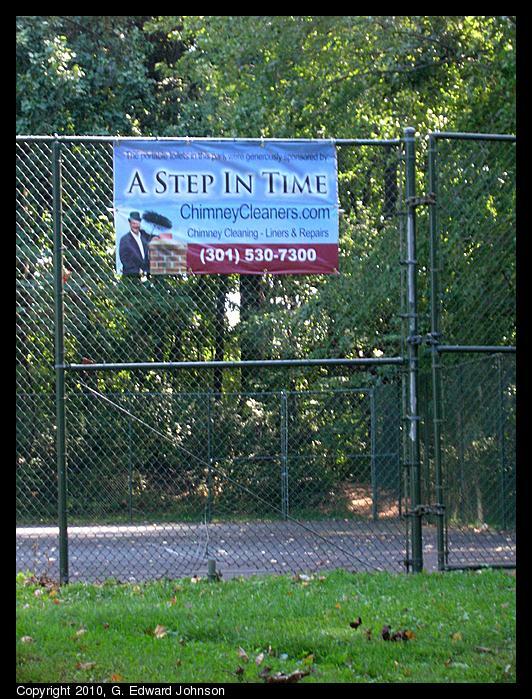 Three banners advertising a local company, one on the tennis courts and two on the baseball diamond. At the top of the banner it said "The portable toilets in this park were generously sponsored by:" I really don't like advertising in the parks, on the other hand, the port-a-potties are a really nice thing to have. Hopefully in the future the county will be able to pay for them on its own, but this year at least it seems like an OK solution. 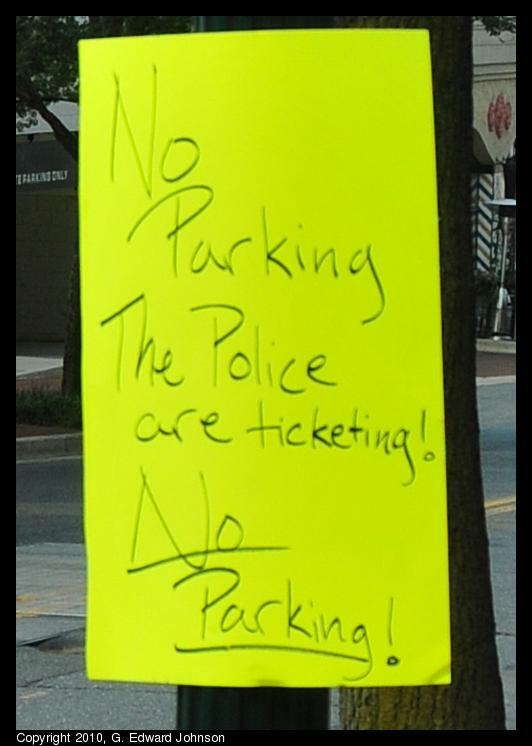 I was walking down Elm Street today and saw this interesting handmade no parking sign. It says "No Parking, the Police are ticketing! No Parking" I'm not sure what the root cause of this is. Did someone get annoyed that people were parking where they shouldn't? Did someone's client's car get ticketed? who knows. Right above this sign is the real no parking sign. New Subway at Georgetown Square. 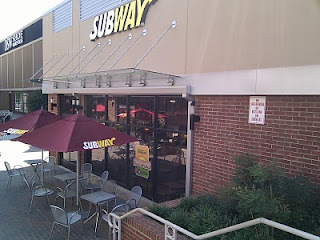 In the past month a new Subway sandwiches opened in the Georgetown Square shopping center on the corner of Old Georgetown Rd and Democracy Blvd in Bethesda, MD. A new karate place (Kicks Karate) also opened, both of these are where the Blockbuster Video used to be. 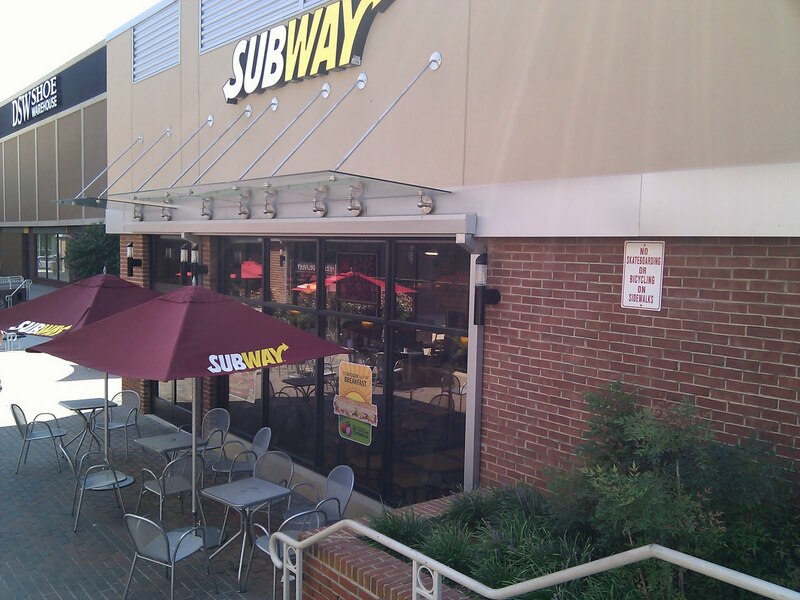 The Subway joins Flippin' Pizza, Chipotle, Bradley's Ice Cream, and Giant as lunch time options for students of Walter Johnson High School, right next door. Today is the first day of school in Montgomery County so watch out for kids. Walter Johnson has an open lunch policy so right around lunch time masses of kids stream out and head for one of the above restaurants for a quick bite to eat. I have been in the Giant a few times right at lunch and it is interesting to see the volume of kids that suddenly appear. Last week I was walking along Hampden Lane between Arlington Road and Woodmont Avenue and I noticed they were tearing a house down. Today, it was totally gone. Intrigued, I went looking for information on what is going in there. Initially, I thought it was related to plan #820070100, which is to build 60 condos (or apartments, I couldn't tell which) along the road, however, only one building was being demolished. I believe I have pieced together the story now. There are 5 lots along Hampden lane that are connected. Lot 1 being on the corner of Hampden Ln and Arlington Rd. Originally, Lot 3 was transfered to the county for them to build Moderately Priced Dwelling Units on (this was to fulfill a the MPDU requirements for another project.) The owner of the rest of the lots said it will be much better to swap lot 3 for lot 5 so they could build a single building (this was in the 2005-2006 time frame). 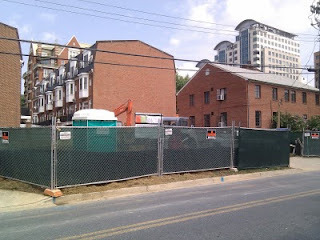 It looks like that was approved so lots 1-5 will have the 60 condos but construction hasn't started yet. 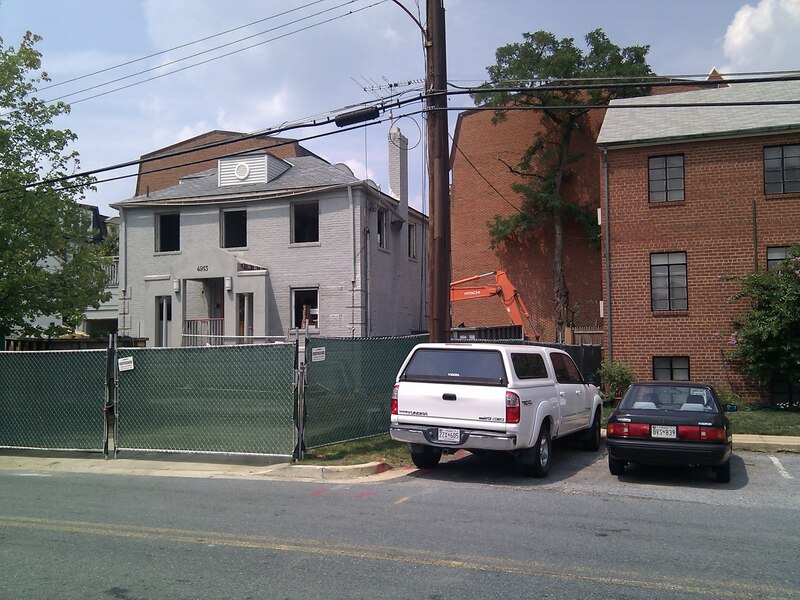 Lot 5 will now have Transitional Housing, a single three-story building with six one-bedroom and six studio apartments, owned and operated by the Housing Opportunities commission (although they view the housing as "supportive" not "transitional", I don't know what the distinction is). for homeless adults who have experienced prolonged episodes of homelessness, have at least one disabling condition and possess other challenges that can contribute to difficulty housing them. Tenants of Home First are placed into a permanent home – through one-bedroom apartments or four-bedroom homes – and provided with wraparound services to ensure that they remain housed. So, if you are one of the many working people who who would like to live within walking distance of Bethesda Metro Station but can't afford it, your best bet is to quit your job and become homeless! The Montgomery County Fair starts Tomorrow, August 13th and runs through Saturday, August 21st. This Friday and Saturday are mostly about the amusement rides, the animals and the other exhibits open on Sunday. There is tons of stuff for kids of all ages to do. There are rides that suit kids from 3 through teenagers, there;s the animals, cows, pigs, sheep, goats, rabbits, ducks, chickens, plus Old MacDonald's Barn with a few more for the kids. At night there are outdoor movies. 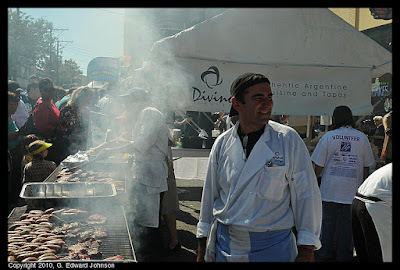 There is also the pig races, if you have never seen them they are worth a look. If you are interested in crafts, or photography, lots of people enter what they have done and prizes are awarded in many categories. Each day they have special events too, for instance, Wednesday and Thursday there is a monster truck show, and Friday and Saturday there is a demolition derby (these events cost extra). Starting August 15th, Bethesda Library (7400 Arlington Rd, Bethesda, MD) will be open on Sundays from 1-4pm. Not long ago I wrote about parking no longer being free, so this is an improvement. It is part of a larger initiative to keep some libraries open on Sunday year round. 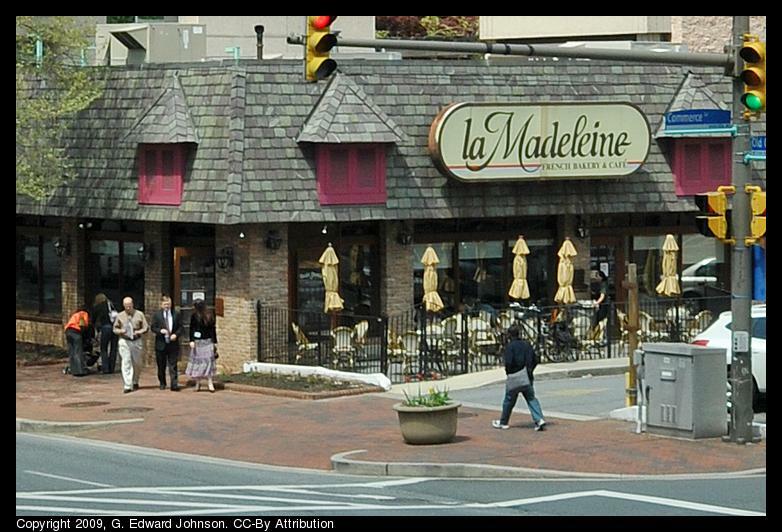 Bethesda, Germantown, Marilyn J. Praisner, Rockville Memorial, Silver Spring and Wheaton will now have year round Sunday hours. I seem to recall that all library used to be closed on Sundays in the Summer but open on Sundays during the school year. I didn't see any mention of opening the rest of the libraries in the system on Sundays this fall so it isn't as much of an improvement as it seems. 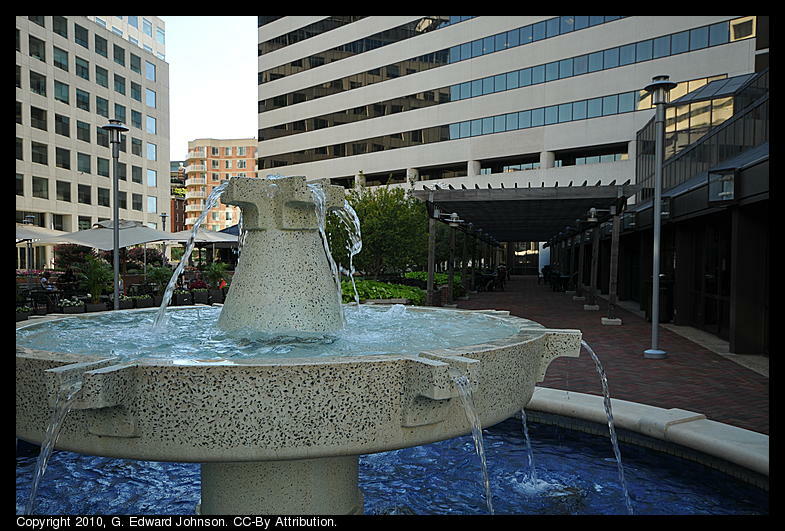 This fountain at the Bethesda Metro Plaza was dry all last year. This year, however, they got it going again. 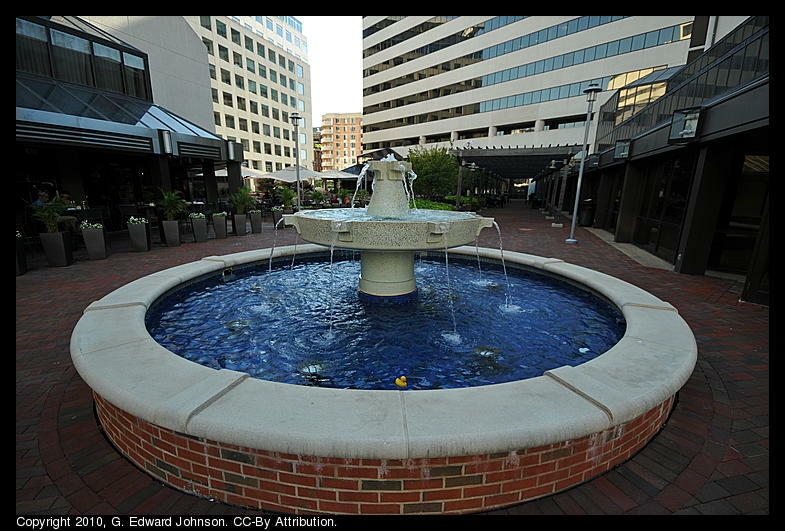 It is a simple round fountain and the edge is wide enough to sit on all the way around. I did all but a couple of the fountains in Bethesda, MD last year, if you want to catch up you can read all of the Bethesda fountains series. 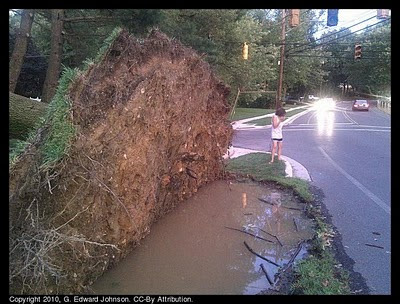 A commenter on a previous story mentioned how impressive the tree roots of the fallen tree on Fernwood Road in Bethesda, MD were. Here's a closer-up picture of them. You can see the pulled up ground was significantly taller than the woman standing on the other side. Yesterday, they trimmed that tree and put it back up-right. It made a song run through my head "I get knocked down, but I get up again". I can't imagine that it will survive, but hey, it is standing up. You can see the jagged outline on the ground where the dirt had pulled up. After finally getting back to normal from Sunday's storm and extended power outage, this afternoon I heard the familiar rumble of thunder. I still like thunderstorms, but I was thinking to myself, "oh no, here we go again". The lights flickered a few times but fortunately, power stayed on. 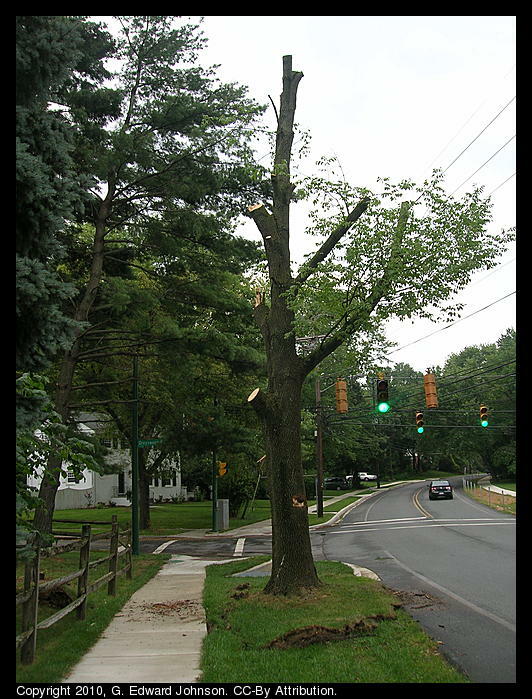 I know there are still some people in Montgomery County without power from the last storm, hopefully no more outages occur for a while. 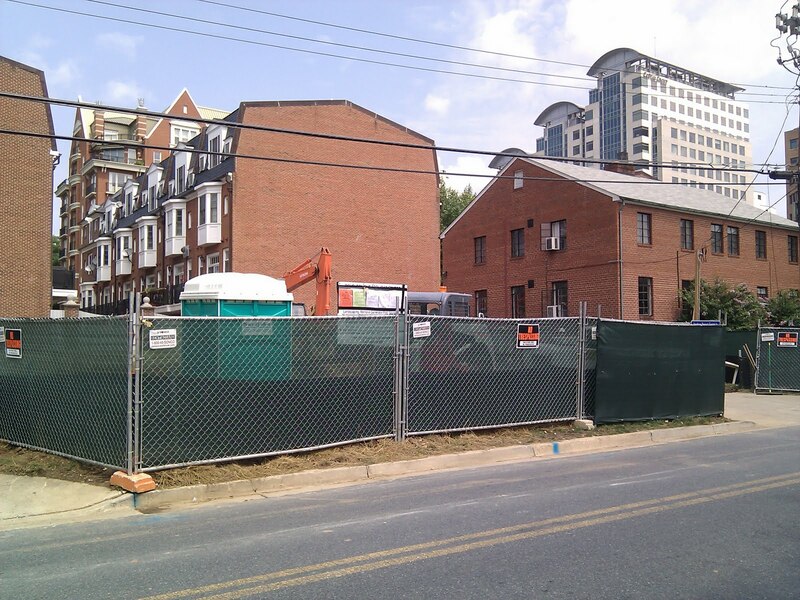 Update August 7: The tree has been removed. 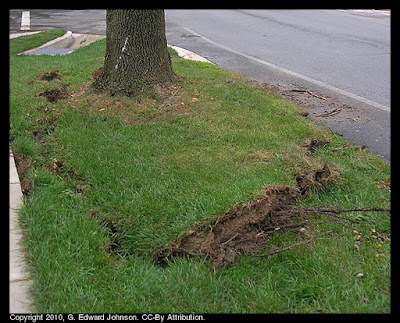 It seemed unlikely that it would survive anyway and the risk of it falling again seemed high, so I am both unsurprised and glad.